I love putting healthier spins on recipes that we think we “can’t have” when we’re eating healthy. One of my goals is to help you make healthier, more empowered choices around food so you can look and feel your best and have all the energy to do the things you want to do in your life…without feeling deprived! 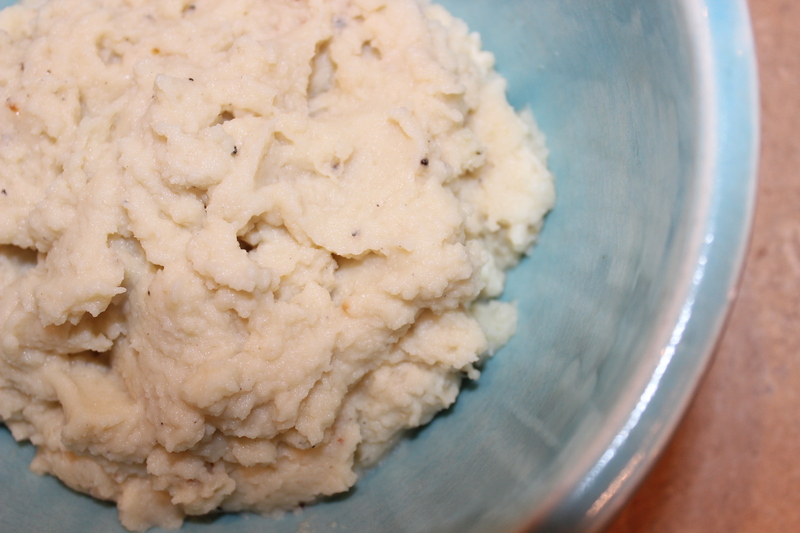 Today we’re going to focus on one of most people’s all-time favorite foods…mashed potatoes. Except we won’t be using potatoes. We’ll be using another seasonal vegetable instead…cauliflower! Trust me on this one. I was skeptical at first, too, but we served this at my mom’s birthday dinner, and everyone gobbled it up! After trying this dish, you may find that you prefer it over traditional mashed potatoes, which tend to spike our blood sugar and don’t contain all of the nutrients and cancer-fighting power we can find in cauliflower. First, a few words about the amazing health benefits we can find in cauliflower. I like knowing “why” something is good for me…not just whether or not it is! Cauliflower’s green friend, broccoli, tends to get way more hype, but cauliflower is a potent cancer-fighter, too, and a fellow cruciferous vegetable. Here are a few reasons why you may want to add more cauliflower into your life! It’s a GBOMBS food. Read more about anti-cancer, anti-inflammatory GBOMBS here. It contains sulforaphane, a compound that kills cancer stem cells, thereby slowing tumor growth. It also greatly improves blood pressure and kidney function AND promotes digestive health. It fights inflammation. Inflammation is at the root of why we are sick and can’t seem to get rid of stubborn weight. Reduce inflammation, and you’ll be much more likely to resist disease and release weight. It helps us detoxify. In addition to inflammation, toxicity causes us to get sick and keep packing on the pounds. The more we help our bodies detox, the better off we’ll be. If you’ve never bought a whole head of cauliflower before, it can be kind of tricky to break apart, so I’ve added a video that shows you how to make that process super easy! Here’s a link to order the towels I mentioned in the video. I learned about them by reading Tim Ferriss’ book, The 4-Hour Chef, and we love them because they make fantastic dish towels! Convinced yet? If you like mashed potatoes, you will love the recipe below! It’s a healthier alternative to traditional mashed potatoes because of all of cauliflower’s awesome health benefits above and because it won’t drive up blood sugar the same way a white potato will. Put the cauliflower in a steamer basket over 1-2 inches of water in a pot. Bring water to a boil and steam the cauliflower until it softens (about 12-15 minutes). You should be able to stick a fork through it easily. Put the cauliflower in a food processor and add the garlic, ghee/butter or oil, black pepper, sea salt, thyme, and cornmeal. Pulse to achieve desired consistency (chunky vs. smooth). If you’re using almond milk, add it 1 tablespoon at a time. Adjust seasonings based on your taste preferences. Enjoy! Rachel – made this with dinner tonight. It really is amazing. I am going to try and sneak it past my daughter the next time she is home. Thanks for the tip. Oh my goodness…made this last night with some lamb meatballs. Sooooo…delish! Thanks Rachel!! Oh good! I’m so glad! That sounds like a delicious meal and something my husband would ask me to make!